WASHINGTON, D.C. - Ohio Gov. 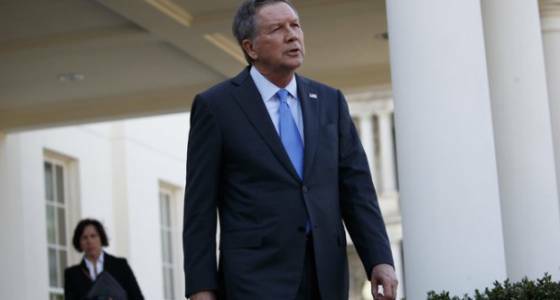 John Kasich and Champaign County GOP Rep. Jim Jordan dueled over Obamacare repeal in separate Sunday morning television appearances, with Jordan arguing that last year's election election results require the program's full repeal and Kasich urging its Medicaid expansion be kept. On "Face the Nation," Kasich told CBS's John Dickerson that Republicans should work with Democrats in the U.S. House of Representatives to secure a replacement that "still provides coverage to people." He said that getting rid of the whole thing - as "some very conservative Republicans in the House" want to do - isn't acceptable because it would leave 700,000 people in Ohio and 20 million nationally without insurance coverage. Kasich said he agreed with former House Speaker John Boehner's assessment that Republicans will probably try to fix the Affordable Care Act's flaws, and "put a more conservative box around it." "Republicans can go and do what they want, and I'm going to talk to them," Kasich told Dickerson. "But at the end of the day I'm going to stand up for the people that wouldn't have the coverage if they don't get this thing right." When asked about Kasich's remarks in a separate appearance on ABC's "This Week George Stephanopoulos," Jordan said the American people were saying "get rid of this law, we know how bad it is" in this year's election. "We didn't tell the American people we are going to repeal it, except we are going to keep the Medicaid expansion," said Jordan. "We didn't tell the am people, we're going to repeal it except we're going to keep some of the tax increases .. We told them we will repeal it and replace it with a market centered, patient centered plan that actually brings back affordable health insurance." Jordan said the House Freedom Caucus - which he co-founded - has worked on a replacement plan with Kentucky GOP Sen. Rand Paul that "empowers families and doctors, not Washington." The bill they back would end the Medicaid expansion backed by Kasich, eliminate most regulations on what health plans must cover, and offer a tax credit that people could use to fund Health Savings Accounts. Republican leaders in the House and Senate have not yet unveiled their formal plan for fixes.